Italian meringue, also called cooked meringue, has a more complex preparation compared to the classic French meringue. This type of meringue can be used as French meringue to make small hard meringues or to make different types of preparations such as mousse, butter creams or others. It also is a perfect option to decorating certain cakes. 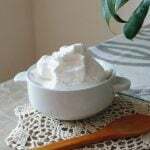 The version that I propose today follows the classic preparation of Italian meringue but I have replaced the classic sugar with xylitol, to make it healthier and less caloric. I await your opinions. Phase 1 · Phase 2 · Phase 3 Serves: 1 - 2 Prep Time: 20 min. Cooking Time: 0 min. This recipe is suitable for the Fast Metabolism Diet – FMD Phase 1, Phase 2 and Phase 3; With these quantities, you get 2 P2 snacks for <20 pounds or 1 P2 snack for >20 pounds. If you decide to bake your meringue, just follow the recipe and, at the end, put the meringue in a pastry bag; on a baking sheet lined with baking paper, creates some meringues of the dimension you prefer and let them dry in the oven at 60º C -70°C (140ºF - 160ºF) during 4 hours. Remember that when you bake meringues, the oven should never exceed 100ºC (212º F).